Algarrobo , a municipality in the province of Malaga is located 40km southeast of Malaga, bounded by the Mediterranean Sea and the municipalities Arenas, Sayalonga, Vélez-Malaga and Caleta de Velez. Algarrobo Pueblo, with its winding and steep streets, is situated 86 meter above the sea on the slopes of two hills, within 4 kilometres from the beach. In the village are small shops for your daily needs, banks, doctor, schools and a public swimming pool and tennis courts. A frequent bus service is running between the village and the coast. In spring the rugged and rocky hills are coloured pink and white by the blossom of thousands of almond trees. This attractive area is very popular, because of the combination of nature, the vicinity of all amenities, country side though close to the coast. Algarrobo has focused their tourism activity on the coast, known as Algarrobo Costa, with high rise apartment blocks along the sandy beach. The sea-side villages Mezquitilla and Lagos also belong to the municipality Algarrobo, but are quieter. Benajarafe is a village situated on the coast, in the heart of the Axarquia, a region that is located in eastern Costa del Sol in the province of Malaga. This former fishing village is located 12 kilometers from the town of Velez-Malaga and 20 km from the provincial capital Malaga. Benajarafe is divided into two distinct parts, Benajarafe Costa and Benajarafe Alto. The first is the main sector of the population. Benajarafe Alto consists of a large number of houses, scattered from the top down to the sea. In recent years they have built a number of important developments and in 2005 was completed much of the work that resulted in a beautiful promenade with palm trees. Most important for tourism in this town is undoubtedly the huge beach which gives over nearly 2 kilometers with beach restaurants and facilities like sun beds and parasols. The national coastal road N-340 separates the beach from the population, school, banks, small shops and bars. Currently many foreigners (mainly French, German and English) who visited the village have chosen to have their summer homes here. Enjoy one of the best climates in Europe, with summers full of sunshine and a calm sea that mimics the tranquility of the village. The coastal village Caleta de Vélez is located southeast of Malaga in the region of the Axarquia, divided by the coastal road N340. 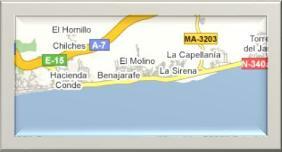 The nearest town is Torre del Mar (2km) to be reached within a 15 minutes stroll via the beach promenade. Beach, Boats & Golf are the key words to describe the versatile holiday resort Caleta de Vélez. Next to the fishing port of La Caleta (the largest in the province of Malaga) you will find the sports harbor offering over 200 berths to sailing yachts and motorboats. The sandy beach of Caleta de Vélez stretches all the way to Torre del Mar and is enhanced by a nice beach promenade. Just 2 minutes drive from the beach is the 18-holes golf course & residential resort Baviera Golf. Popular residential areas are Caleta del Sol, Trayamar Ribera and the resort Baviera Golf. 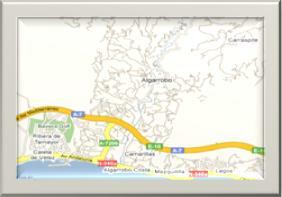 Torre del Mar is a coastal town, just 30 minutes drive from Malaga. 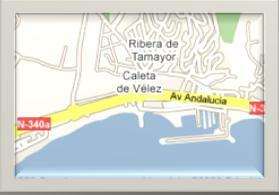 The beach resort of Velez-Málaga is located between the coast and the motorway. This former fishing and agriculture village has transformed into one of the largest coastal towns on the East side of Malaga. 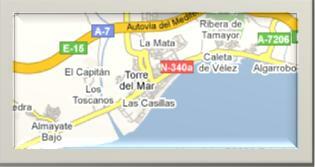 From June to September, Torre del Mar is a popular holiday resort for all kind of nationalities. The main attraction is the beach with its impressive beach promenade of almost 4 kilometers in length uniting Torre de Mar with the village Caleta de Vélez. On the beach are many Chiringuitos serving fresh fish – open throughout the summer and in the winter in the weekends packed with Spanish families during lunch. Plenty of restaurants, bars and discotheques are located on the Paseo de Larios, in between the beach and the main street Avenida de Andalucia where you will find most of the banks and shops. From the bus station are bus services to all main cities & villages along the coast and inland. A tram service connects Torre del Mar with Velez-Malaga and passes on the edge of Torre del Mar the popular shopping centre ‘El Ingenio’, one of the two commercial shopping centers of the East side of Malaga. The nearest golf course is Baviera Golf, just 5 minutes drive from the town centre. Añoreta Golf is the first 18-hole golf course, built in 1990, at the east of Malaga. The Añoreta Course was designed by the famed Ryder Cup Champion José María Cañizares. The par 72 has a longitude of 6,016 metres for professionals and 5,833 for amateurs. Añoreta Golf proves itself to be an excellent challenge for golfers of all levels with its varied and pleasant undulating greens surrounded by trees and water accentuating the natural beauty of the setting. Many of the holes are truly spectacular, in particular hole 7 with its breathtaking sea views. The course offers a seventeen-hole par 3 bordered by an immense lake enhancing the emerald turf. The Añoreta Golf location takes advantage of the outstanding Mediterranean Climate that only the Costa del Sol can offer every day of the year.